2 bed/2 bath in Downtown Mystic restaurant district. Walk everywhere. Sleeps 6. This beautifully restored apartment is situated across from the Mystic River right in the heart of Historic Downtown Mystic. It features hardwood flooring, granite counter tops, stainless appliances, heat and A/C units in each room, and dimmable lighting. The apartment comes fully furnished. Sheets, towels and cooking essentials are provided so you will have everything you need to feel right at home. This apartment is one of two units located in an Historic Greek Revival-Style duplex home originally built in 1845 by George Packer. The apartment has been completely re-built from the ground up with high end finishes. Enjoy water views of the Mystic River from the front porch and East-facing windows. 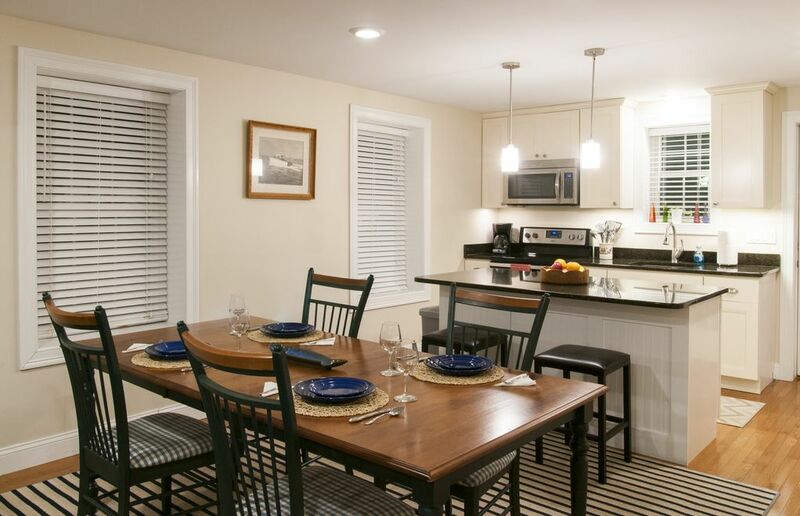 You will be steps away from some of the best restaurants and attractions in downtown Mystic. This apartment is located on Water Street which features 7 great restaurants right on the same street! Water Street connects with West Main Street so you are never more than a 2 minute walk away from the main shopping strip, ice cream shops, Mystic Pizza, historic drawbridge and so much more! The Mystic Aquarium and Mystic Seaport are an easy 20 minute walk / 5 minute drive away and offer ample parking. This property is set up to comfortably accommodate up to 6 guests. Each of the two bedrooms feature a memory foam queen bed and the living room features a sleeper sofa with a full sized memory foam mattress. Clean linens and towels are provided based on the number of guests indicated in your reservation. You will be provided with clean bath and hand towels based on the number of guests in your reservation and length of stay. The full bathroom is located on the 2nd floor and features a new, extra deep soaking tub with shower and front-load LG washer and dryer. The additional bathroom, located on the first floor features a 36" shower stall. Great for rinsing off after the beach! Free off-street parking for one vehicle IS included with this rental. Parking is conveniently located directly across the street from the apartment in the marina parking lot. Free street parking and shared public parking lots are also available in the immediate area as well. This apartment is located in a house right next door to another house me and my family has owned since 2012 (VRBO listing #484513). When this property came up for sale by the out-of-state owner, I jumped on the opportunity to purchase and fix it up in order to share it with fellow travelers. The views of the Mystic River from the front porch and the close vicinity to downtown Mystic restaurants and attractions make this rental an ideal place for a weekend getaway or an extended vacation. Dedicated off-street parking and easy access to the Mystic Amtrak station make traveling to and from the location a breeze. Once you're parked you can easily walk everywhere in Downtown Mystic! Located within the Historic Downtown Mystic restaurant and shopping district. Water views of they Mystic River from front porch and front windows of house.